Pish-Pash aka Pish Pash is a family favorite; at least they pretend whenever I make the Indianised Hotchpotch at home! Pish Pash is my one-pot solution whenever there is a need to include chicken, rice, and potato as part of the meal yet nobody is ready to grab Biryani. Pish Pash is not about the look, actually, it looks messy but I cannot say that about the taste. Some say it is a form of Khichri while some defined it as Indian Risotto. However, for me, Pish Pash is what it is; no comparison with any other dish. If you are new to cooking, have limited resources, and a non-vegetarian and consider yourself the king/ queen of bachelor cooking, Pish-pash is the dish for you 🙂 . I for the first time cooked it, when I was in Bihar back in 2008-09 and was living alone. That actually was the time when this humble food blog Debjanir Rannaghar came into existence. This used to be my one pot meal upon returning from the office. I mostly ended on cooking Pish-pash in bulk to cater the lunch I meant to carry to the remote areas of Bihar while I was traveling to the field. Those were eventful days for sure and this humble dish was my savior for long. Pish-Pash is actually a medley of Rice, Chicken Chunks and Potatoes and this dish is cooked with very limited spices mostly in the form of tempering not paste or powder. In fact, the spices are not used as typical tempering too. Those are boiled with water to give the dish a nice aroma and distinct flavor. 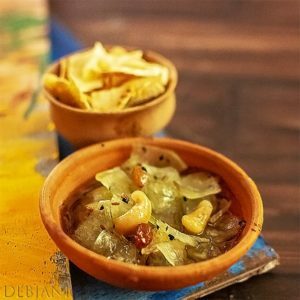 Almost, all the noted books on Indian recipes have defined this dish as the epitome of comfort dishes and ideal as a dish to be served to a sick person. My little collection of food books are inclusive of Prajnasundari Devi’s Amish o Niramish Ranna, Lila Mazumdar’s Rannar Boi, Parsi Food and Customs by Bhicoo J. Manekshaw and I found the similar description by almost all of them. They all opined that Pish Pash is ideal for the meal of a sick. Sick or not, I love Pish-Pash. Especially after returning from office, dog-tired needless to say and when I need something beyond Gobindobhog Bhat, Boiled egg, and Ghee, I ended on making Chicken Pish-Pash. When Pasta was a toddler and started eating solid, Pish-Pash used to be a regular inclusion of her meal. I have never cooked separately for her. She was given everything I used to cook at home from the very beginning. As a kid, I have been provided with separate food (with less oil, fewer spices) which I found completely unnecessary. It created the problem when I started eating outside home. I decided to give Pasta whatever we eat from the very beginning to not to create a similar problem I have faced. Mehebub also loves this Rice Chicken Hotchpotch. Whenever I cook it at home, I ended on making a big batch. Actually, we both carry it as part of our lunch on the next day. Pasta also takes a little portion as part of her lunch box. We prefer a spicy side with it, mostly something prepared with egg, either Egg curry or Egg Shorba. In our place, Pish-Pash is a comforting dish not typically something meant for sickness. I mostly follow the recipe provided by the books I have mentioned above while making the Pish-Pash. Yes, the recipe is similar to all the books. The only modification from my side is not to make it super-messy with extra gravy. You may find that from the pictures. Butter is optional but gives the required aroma to the dish. 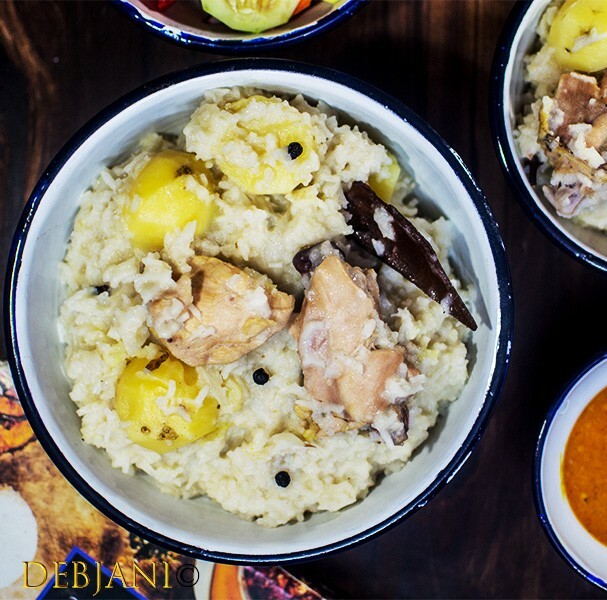 Pish-pash aka Pishpash is a Rice, Chicken, and Potato based Indianized hotchpotch prepared with almost no spices. Wash rice thoroughly and soak in water for 15 minutes. Wash chicken chunks as well. Chop Onion roughly and chop the garlic as well. Peel the skin off the potatoes and cut into halves. If using smaller potatoes, no need to cut the same. Take around 2 liters water along with the whole spices which are Cinnamon, Black Peppercorn, Black Cardamom, and Clove in a Thick bottom pan. Cover the pan and boil the water in high flame until the water reduces to ⅓. Now add Chopped Onion, chopped Garlic, chopped Ginger followed by the Chicken pieces and reduce the flame to low. Cook for around 5 minutes in low flame. Add salt to taste. I have added around 1 Tsp. Salt. Now add the Potatoes and cook for around 10 minutes in low flame. Add Rice and give the mixture a thorough mix. Add the milk as well. Cover the pan with a lid and cook for around 10-15 minutes or till the rice is over-cooked and messy. If required add little Milk or water to keep the Pish-Pash soggy. Once everything is well-cooked, switch off the flame. Add Butter and lemon juice and mix thoroughly. Instead of Basmati rice, Gobindobhog rice can also be used. In fact, it works quite well if you want your Pish-posh soggier. You may add green chilis as well. I use the rice and chicken in 1:2 ratio which can be changed as per taste. Pish-Pash can be prepared without Chicken or Potatoes as well. I prefer mine not excessively soggy/ soupy. If you like, you may keep the moisture more. 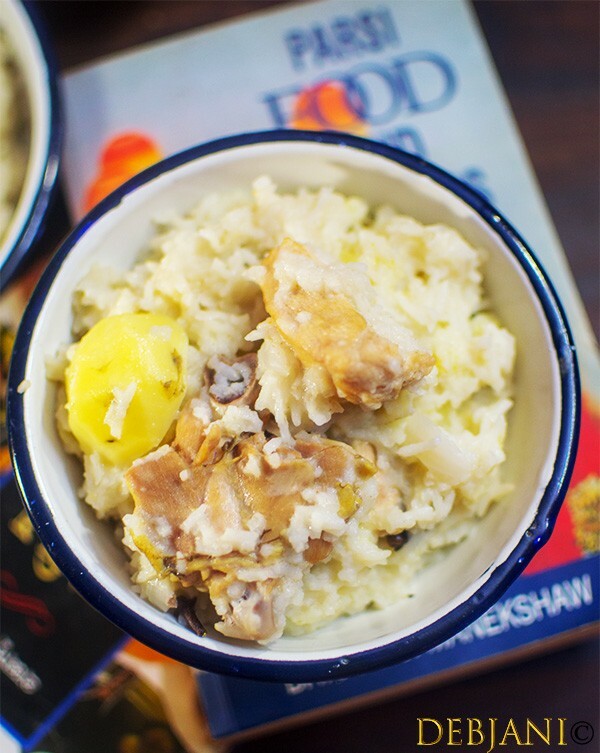 Have you tried the Pish-Pash Recipe from Debjanir Rannaghar! Do let me know how it came out. Also, I would love to see a picture of the same which you can share here on dolonchttrj@gmail.com or on Instagram you can use my hashtag #debjanirrannaghar or can tag me at @foodofdebjani.